Does Shved form spell end for Burke? Celtic winger Maryan Shved has continued his fine form for Karpaty Lviv ahead of his return to Glasgow in the summer. The Ukrainian international signed for the Hoops in January but returned to his previous club to see out the season. And the 21-year-old's form could mean no permanent deal for on-loan West Brom winger Oliver Burke. The former RB Leipzig man, also 21, has struggled as a centre forward and has barely been played in his natural position for Celtic. Rumoured Celtic managerial target Marco Rose has confirmed he will take over at Borussia Monchengladbach from next season, succeeding Dieter Hecking. 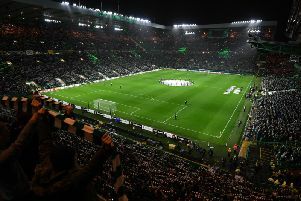 The Red Bull Salzburg boss had been loosely linked with the Hoops job, and the rumours intensified when the German coach confirmed he would likely depart the Austrians in the summer. However, a host of managers have been linked with the Celtic job, most recently former Spurs and Chelsea boss Andre Villas-Boas, Belgium manager Roberto Martinez and Newcastle boss Rafa Benitez. Former Celtic defender and assistant boss Johan Mjallby has urged his old club to give the manager's job to Neil Lennon on a permanent basis. The Swede, who served as Lennon's No.2 during his first stint at the helm, said: "Neil is probably the safer bet, but it depends on how the outlook is from the board. "They are obviously aiming to keep winning league trophies, because that's their bread and butter. "But they also have Europe to think about and will be looking to crack that nut as that was probably the only disappointment of Brendan's reign. "I'm biased because I know Neil and loved working with him. I know how passionate he is for Celtic. If he was to get the job, he would probably play a little bit different to the way the team played under Brendan but that's natural."